I do liquid reviews when I am asked or when I really like an e-liquid. Even when asked, however, I let folks know that I'm going to give an honest review regardless. Furthermore, I'm going to try and look past my personal tastes and describe what I taste whether I like it or not. Fortunately, my Momma raised me to eat what was set in front of me or go hungry, and so, I tend to like lots of things. This time, though, I volunteered to do the review after winning some e-liquid in a contest. The juice is good and reasonably priced! How good? When it arrived, I was just starting to tinker with the Boreas (8 ml in that tank, remember?). I dripped just a little bit, liked it well enough and filled the tank. The Boreas can tear through some juice! I almost used up the 30 ml bottle in two days! I managed to stop myself with about 4 ml left so I could film a proper review. When not using the Augvape Boreas, I was using a brass UD Igo W Plus RDA on top of my brass Stingray. The RDA was built to .35 Ohms with a 2.4 mm inside diameter, 26 gauge (.4 mm for you European types), 6 wrap spaced dual coils. I was dry-burning lightly, rinsing, and re-wicking between e-liquids. I used Labo Japanese Organic Cotton for the wick. I also tested the e-liquids in an eGo setup (using a Kanger Aerotank Mini and switching home-built 1.8 Ohm coils between e-liquids) and an RTA (a Goliath V1). A further note on my testing regimen: I DO NOT STEEP JUICES! I equate steeping juices with buying a car that can't be driven without parking it in a dark garage for several weeks. When I get a juice, I want to vape it. When I get a car, I want to drive it. 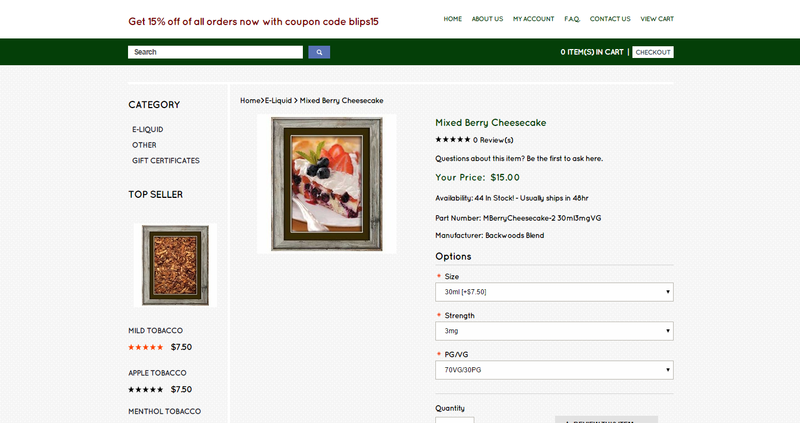 It is called Mixed Berry Cheesecake on the website, and Berry Cheesecake on the bottle, and that is what you get. 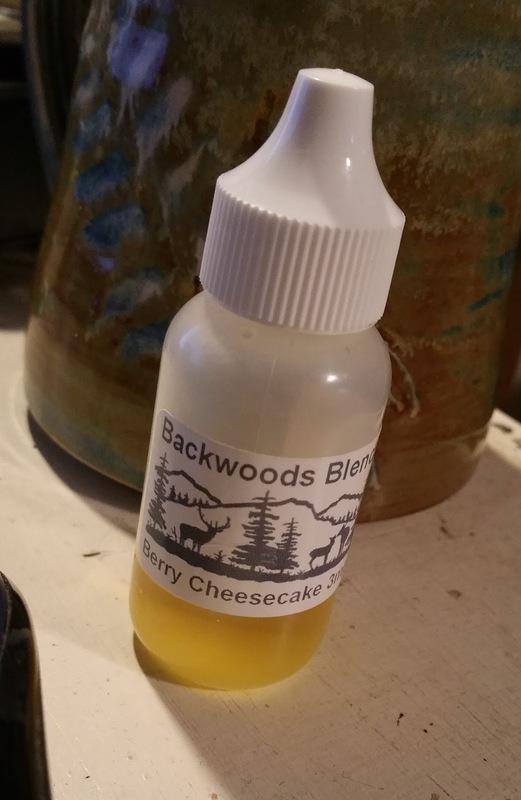 Backwoods Blends is to be commended because cheesecake can be a tough one to get right. more often than not, cheescake vapes end up tasting a bit like feet. Not this one. There's a creamy smoothness, a hint of saltiness, the graham shows through, and the berries. This is another win, in my opinion. Many "fill-in-the-blank Cheesecake" flavors go way over the top of with the fill-in-the-blank to mask their failure with the cheesecake. Here, there is a subtle sweetness that is a prefect balance to the cream of the cheesecake and the earthiness of the graham. If you are into dessert vapes, but don't like the over-the-top sweetness of some of the other premium brands, or the cough syrup taste of many berry blends, this is good. If, on the other hand, you're looking for super sweet, give this a pass. This flavor is not yet on their website. I tried smelling it, but either my smeller is busted (long story, there... maybe at the end of this write up), or the e-liquid doesn't have much of a scent. I did get something, but couldn't pin it down. I dripped, fired, took a pull, and was completely taken aback. This was a menthol tobacco. When I smoked, I smoked Pall Mall Menthols, and I didn't pick out that scent at all. I could certainly taste the tobacco, and it was definitely menthol, but neither flavor overpowered the other. I would compare this to, perhaps, a Pall Mall Menthol Light, or a Camel Menthol. It is surprisingly smooth, and although I generally avoid tobaccos and menthols in particular because that is what I used to smoke, I might just keep this around. If you are a menthol tobacco smoker, and you want something familiar to quit smoking with, this might just be the ticket. If you were a menthol tobacco smoker and you want the occasional pleasant reminder, this is quite nice. There is no doubt in my mind that almost every vaper with more than one year of vaping under their belt has, at some point, tried an RY4 variant. These RY4s that have flooded every corner of the market range from super sweet, caramel/vanilla blends without a hint of tobacco outside of their name to strongly tobacco flavors with just a hint of smoothness provided by some caramel and vanilla. I, myself, have tried several RY4 flavors and RY4 was the one flavor my mother liked and used when she weaned herself off of cigarettes with the eGo ONE Mini I gave her. I still didn't get much of a scent off of this, but the flavor, again, is nicely balanced. It IS a tobacco, but the sweetness of the caramel and smoothness of the vanilla is just enough to take the edge off. I get all of the flavors and they mingle nicely. I will definitely be keeping this around as I think it will pair nicely with a stout beer or a good cup of coffee. When I review a juice, it's not just the taste and consistency. I also look at the price, packaging, and marketing. Price: Their e-liquids are available for $7.50 per 15 ml, and $15.00 for a 30 ml. Apparently, their more popular blends get a separate page for 60 ml bottles ($29) and for 120 ml bottles ($55). I don't find these prices in the least bit unreasonable, although I know that there are some less expensive options out there. Packaging: The e-liquid I received came in a sturdy 30 ml plastic bottle. It was capped by a safety sealed cap, but it's not a child-resistant cap. No children were used in the testing of the cap, however. A simple label is wrapped around the bottle with a nice black and white line art drawing of a woodland scene with elk or deer, trees, hills... y'know... a woodland scene. Above that drawing is the Company Name in a simple, easy to read sans serif typeface. Below the scene is the name of the e-liquid and the nicotine strength in a smaller, yet still easy to read, sans serif typeface, To one side of this is a tiny block of text that I was still able to read without resorting to a magnifying glass, with some warnings. They may not be full proposition whatever-that-number-Californians-keep-using compliant, but it certainly covers the basics. 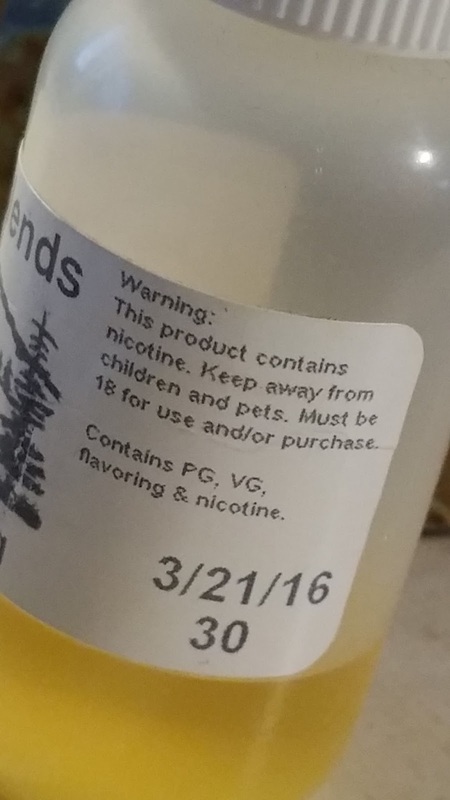 Beneath that is a list of ingredients (VG, PG, Flavoring, & Nicotine). Finally, in a slightly larger font size, is the born on date and the size of the bottle. I assume that what it is as there are no identifiers. It says "3/21/16" and on the next line "30." The label does not run when it gets wet. Where it's nicely done, it might benefit from a bit of pizazz or flair, and a couple more pieces of information. For instance, I can only assume that it's the born on date and bottle size. I also assume it is made with USP grade VG and PG. It would be nice to see that spelled out a bit. I know space is at a premium, though, so I salute Backwoods Blends for getting most of the info in there. Most of? There's no contact information. No website or phone number to be found. Marketing: I hate finding an e-liquid, really liking it, and never being able to find it again. There's this lemon bar flavor... but I digress... Backwoods Blends does have a website - BackwoodsBlends.com - which is easy enough to Google-fu and so they are easy enough to find. Their website is easy enough to navigate on the computer and does not hurt my eyes. The site also seems to work mostly fine on a phone. I only had a few instances of cut off text. The site also has a coupon code, but ya gotta go there to see it. 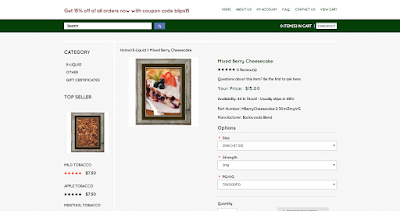 Free shipping is offered for orders of $100 or more, and gift certificates are available. I think perhaps the only real problem I can find with the website is the lack of branding. I would like to see the same sort of woodlands logo incorporated into the website's header just to make sure I'm at the right spot. But most folks could care less about the looks of the website and the looks of the bottle. It's what is inside that matters, right?